Option delta tells the option trader how fast the price of the option will change as the price of the underlying asset moves up or down. We can see this in the following picture. The price of the underlying asset changes by a certain amount or percentage, this is shown on the horizontal axis, and the price of the option or also the profit from the position changes by another amount or percentage, this is shown on the vertical axis. Delta values range between 0 and 1 for call options and -1 to 0 for put options. 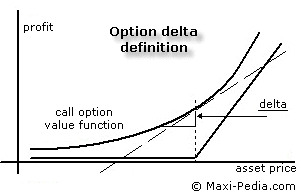 Some traders refer to the delta as a whole number between 0 to 100 for call options and -100 to 0 for put options. Note that calls and puts have opposite deltas - call options are positive and put options are negative. When the position is long a call option, the delta will always be a positive number between 0 and 1. When the underlying stock or futures contract increases in price, the value of the call option will also increase by the call options delta value. On the other hand, when the underlying market price decreases, the value of the call option will also decrease by the amount of the delta. When the call option is deep in-the-money and has a delta of 1, then the call option will move point for point in the same direction as movements in the underlying asset. When the market price of the underlying asset increases, the value of the put option will decrease by the amount of the delta value. Conversely, when the price of the underlying asset decreases, the value of the put option will increase by the amount of the delta value. 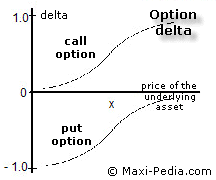 Put options have negative deltas, which range between -1 and 0. As volatility falls, the delta of in-the-money options increases and the delta of out-of-the-money options decreases. Since the delta of option is a measure of how sensitive an option’s price is to changes in the underlying, it is useful as a hedge ratio. A futures option with a delta of 0.5 means that the option price increases 0.5 for every 1 point increase in the futures price. Can you tell me more about option strategies where I can use option delta? Yes, delta plays an important role in risk management related to options and financial positions. For example analyzing the risk profile of the synthetic long call option strategy and also the synthetic long put option strategy calls for assessment of option position delta. Are there any other sensitivity measures that I should know about? Yes, besides option delta, professionals use many other tools to predict how option price reacts to market factors. You can read about option gamma at the Option gamma page. Option vega is explained on the Option vega page. Option theta is explained on the Option theta page.